SB Acoustics SB65WBAC25-4 2.5” Neo Magnet Full Range with exceptionally good response characteristics. £19.85 excl. VAT Geometrically furrowed Aluminium Cone. 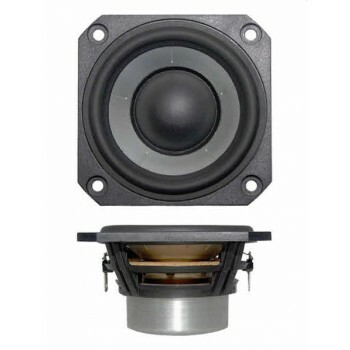 SB Acoustics SB65WBAC25-4 2.5” Neo Magnet Full Range with exceptionally good response characteristics. Featuring a geometrically furrowed aluminium cone for extended usable frequency range. Copper cap for increased high frequency output, reduced phase shift at higher frequencies and improved power handling capability. Low damping surround and non-conductive voice coil former to ensure dynamics and an open/transparent sound character with excellent detailing/resolution. Linear neodymium motor system for reduced distortion, and vented voice coil former for reduced compression.